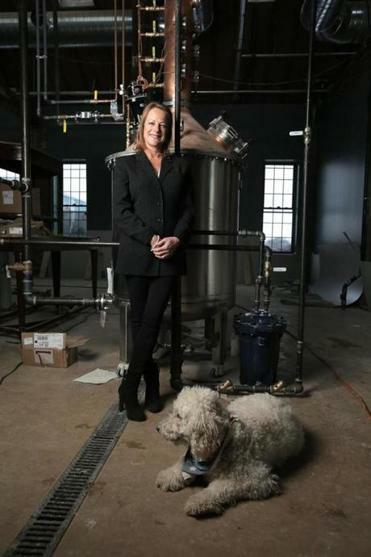 Rhonda Kallman and her dog Sandy, at the Boston Harbor Distillery, which is under construction in a Civil War-era complex in Dorchester. Sometimes, revenge has a taste. For Rhonda Kallman, it might taste a lot like malt whiskey. After her three decades in the beer industry ended when a Food and Drug Administration decision doomed her last company, Kallman is chasing the harder stuff now. Visit her amid the clamor of construction workers putting the finishing touches on the Boston Harbor Distillery in Dorchester, and she exudes the enthusiasm of a first-time entrepreneur. Within the brick-and-beam walls of this Civil War-era manufacturing complex, she sees a new path to success. Kallman steers the conversation to the future, to the promise of the spirits distillery she plans to open this spring. But she cannot help but revisit the past. It has been nearly four years since Kallman closed the New Century Brewing venture that she ran out of her Cohasset home after the FDA essentially banned its caffeinated beer, Moonshot. The agency determined that it was unsafe to include caffeine in malt beverages. The move was aimed at curbing the Four Loko craze. But it famously swept Moonshot into the net. Before New Century, Kallman spent 15 years or so at Boston Beer Co. She helped Jim Koch get the Samuel Adams brand off the ground in the mid-1980s, and left in January 2000 as one of Boston Beer’s top executives. Kallman is moving on from beer, and resists calling this new venture an act of vengeance against the government bureaucracy that wronged her. But at the very least, opening Boston Harbor Distillery has to feel like vindication. The road to Dorchester’s Port Norfolk waterfront was accidental, in a way. Kallman said she was on her way back from checking out a different property when she decided to stop off at Venezia with her husband for a drink in March 2012. She noticed the old factory, across the parking lot, and asked the bartender about it. Six months later, she signed a lease with the Bruno family corporation that owns the property. Rhonda Kallman envisions hosting various events under the distillery’s 40-foot-high ceilings. Kallman has her federal and state licenses lined up. She still needs a certificate of occupancy from the city before she can open to the public or start making whiskey. The goal is for her six-person team — including a master distiller who crafts the recipes — to open the 11,000-square-foot distillery in early spring for tours and commercial production. Eventually, she wants to get a pouring license, which will allow the company to sell cocktails from its bar. Craft distilleries like Kallman’s have been opening at a steady pace. The state Alcoholic Beverages Control Commission reports that 20 farmer-distillery licenses are in place across the state, as part of a licensing system created by the Legislature in 2002. Chris Weld, owner of Berkshire Mountain Distillers in Sheffield, said the change in state law made it easier to get craft distilleries started. But the real driving force, he said, is the widespread embrace by consumers of “all things artisanal,” a movement to buy local and to buy quality. Bully Boy was the first “farmer-distillery” to open within Boston’s city limits, back in 2010. 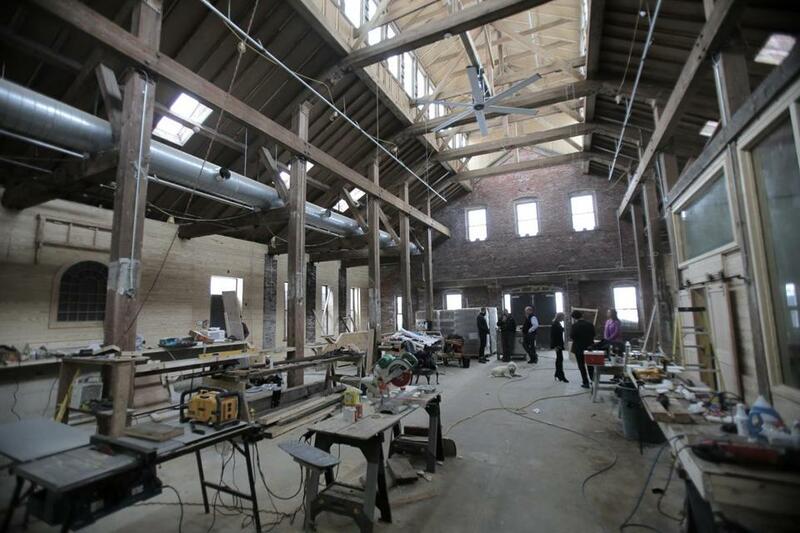 GrandTen Distilling in South Boston followed a year later, opening to the public in 2012. Kallman said she has spent about $2 million launching Boston Harbor Distillery, with help from angel investors. She wants to sell her drinks to restaurants — her team has already reached out to bartenders to build a buzz — and directly to consumers. She envisions broadening the business to host events under the 40-foot-high ceilings. “The real goal is to build a brand that Bostonians can be proud of, like the experience I had with Sam Adams,” she said. In fashioning her new company’s liquor brands, Kallman has borrowed heavily from the Dorchester building’s rich history. There is Putnam New England Whiskey, inspired by the nail manufacturer that first used the structure in the mid- to late 1800s. Then there is Lawley’s New England Spirit. It is made from molasses and maple syrup and named after the yacht builder George Lawley & Son. There is also Seymour’s Coffee Liqueur, a reference to Seymour Ice Cream, the most recent manufacturing occupant, a company perhaps best known as the creator of the Nutty Buddy. And yes, the coffee liqueur contains caffeine, and more alcohol than her Moonshot beer ever did.